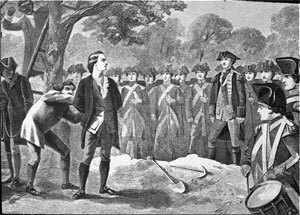 The namesake of the Nathan Hale Memorial Chapter, East Haddam, Connecticut, established in June 1900, is a Revolutionary War hero and a native of Connecticut. Nathan Hale was honored by the State of Connecticut by being named its "State Hero." After Hale graduated from Yale and became a one-room schoolhouse teacher in East Haddam and New London, Connecticut, he volunteered as an officer of the Continental Army to spy on the British for General George Washington. Disguised as a school teacher, Hale crossed the Long Island Sound to gather information about the British, was captured, and, being out of uniform, was "quickly" declared a spy. Hale was sentenced to hang the next day in New York City. When asked if he had any words to say before his sentence was executed, Hale reportedly replied, "I only regret that I have but one life to lose for my country." At his death, Hale was twenty-one years of age. While he is remembered as a spy, Hale's legacy is one of courage, self-sacrifice, and character. Each year, the Nathan Hale Memorial Chapter honors Nathan Hale by celebrating his birthday, June 6, with an annual picnic at the Nathan Hale Schoolhouse and Museum in East Haddam, Connecticut. The National Society Daughters of the American Revolution was founded on October 11, 1890, during a time that was marked by a revival in patriotism and intense interest in the beginnings of the United States of America. The society has admitted over 850,000 members since its inception. Women felt the desire to express their patriotic feelings and were frustrated by their exclusion from men's organizations formed to perpetuate the memory of ancestors who fought to make this county free and independent. As a result, a group of pioneering women in the nation's capital formed their own organization and the Daughters of the American Revolution has carried the torch of patriotism ever since.